A person who has an interest in reincarnation research wrote to me inquiring if Beto O’Rourke, a Texas politician belonging to the Democratic Party, may be one of the political Kennedys, President John F. Kennedy or Attorney General Robert F. Kennedy. At the time, I did not know who Beto O’Rourke was, though soon afterwards I observed that he was on the national news, as he was running for a Texas US Senate seat in opposition to US Senator Ted Cruz. I learned that O’Rourke was a 3 term Texas US Congressman who had been born into a politically active family in El Paso, Texas. 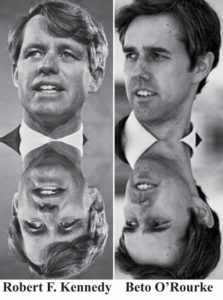 I noted that Beto physically resembled Robert F. Kennedy much more that John F. Kennedy. Click on images to enlarge them. In a session that I had with Kevin Ryerson, a trance medium who channels a spirit guide named Ahtun Re, who has demonstrated the ability to make past life identifications with a high degree of accuracy, Ahtun Re affirmed that Beto O’Rourke is the reincarnation of Robert F. Kennedy. Physical Resemblance in Reincarnation Cases: The facial features of Robert F. Kennedy and Beto O’Rourke are similar. 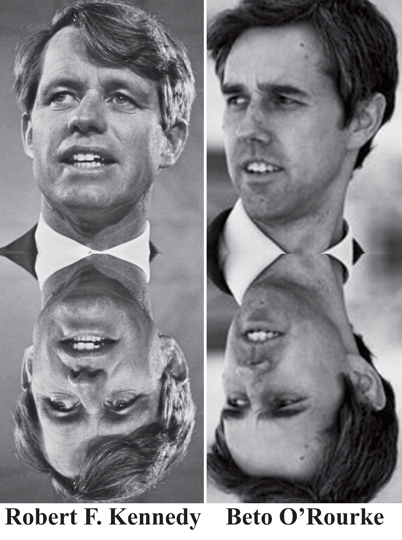 Past Life Talent: Beto O’Rourke and Robert F. Kennedy have demonstrated gifts as politicians. Reincarnation and Planning Lifetimes: Ian Stevenson, MD of the University of Virginia compiled over 1500 childhood past life memory cases that were objectively validated. These cases demonstrate that souls plan lifetimes. Just as souls can plan lifetimes to reincarnate with past life loved ones, souls can plan lives to incarnate into families that will assist in fulfilling goals of the soul. If a soul desires to pursue a political career, then that soul can make agreements to reincarnate into a political family. This was the case in the political dynasties of the John Adams family, the Kennedy family, the Bush family and it may be evident in the Beto O’Rourke reincarnation case.